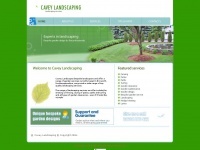 Cavey Lanscapes are based in Brixworth, Northamptonshire, and provide a wide range of top quality landscaping services. The range of landscaping services we can provide include the erecting of fencing, laying patios, paths and turfing and all types of garden clearances - even if it looks like a jungle. The web server used by Caveylandscapes.co.uk is located in Great Britain and run by Iomart DC1 Core Network. 30 other websites are located on this web server. Most of them are provided in the english language. The websites of Caveylandscapes.co.uk are served by a Apache server. The HTML pages were created with the latest standard HTML 5. The website does not specify details about the inclusion of its content in search engines. For this reason the content will be included by search engines.